Although I didn't begin watching until the end of Season 1, Community quickly became one of my favorite shows on television. As someone who is admittedly addicted to pop culture, the constant barrage of references and meta moments is a delight like no other (besides 30 Rock at times). I wish a few more million viewers (and the Emmys) would notice, too. Last week's episode "Remedial Chaos Theory" centered around Troy and Abed's housewarming party. While playing a "rousing" game of Yahtzee, the pizza deliveryman buzzes in and the group tries to decide who to send down to get the pizza. When Jeff suggests a roll of the dice, Abed points out that doing so creates alternate timelines and endless possibilities. What followed, in true Community fashion, were each of the seven timelines—some mundane, some pleasant and one horrific and dark—showing how the night would change with the brief absence of each member of the study group. It's fascinating the way little moments stand out across all the timelines: Jeff telling Britta to stop singing, Jeff hitting his head on the fan, anytime Shirley yells "Oh!" and Britta's pizza monster walk. Though, I have to admit, it was really hard to not just focus on the Evil Timeline on the right—especially that Norwegian troll doll in the fire. 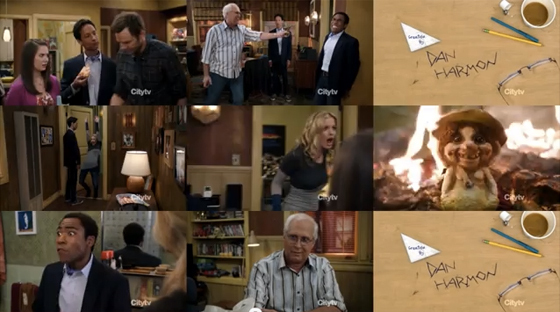 Community airs Thursday night at 8/7c on NBC.